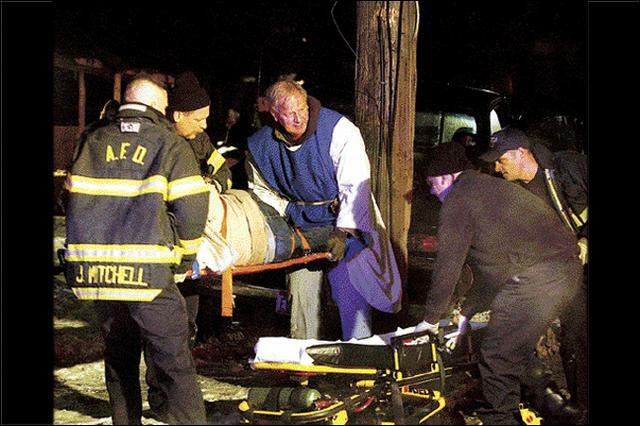 ASHTABULA � A peaceful, live nativity scene suddenly turned tragic Wednesday evening as three people were struck by a truck and injured at West Prospect Road and Samuel Avenue. According to participants in the annual event at the Trinity Presbyterian Church, 1342 W. Prospect Road, five people were taking pictures of the nativity when a black pick-up truck swerved to miss a silver car and slammed into three of the five onlookers and a telephone pole. Traffic was blocked for about an hour as emergency crews from Ashtabula, Saybrook and Community Care Ambulance responded to the scene. At least three of the five people who were taking photographs of the nativity were taken to the hospital by ambulance, police said. A witness who was behind the truck said he saw a tire go flying across the road and then saw people sprawled on the side walk. �One man looked like he had been thrown 30 feet and his camera was next to him,� the witness said. The driver of the truck did not appear to be injured, but his truck sustained serious damage to the front and back ends. The silver car remained on the scene with three possible occupants, witnesses said. Another witness who portrays �Mary� in the nativity scene said there were five people on the sidewalk and then a loud crash. �They say the show must go on, but not tonight,� she said.